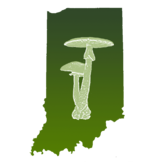 This year the Indiana Academy of Science through the Biodiversity and Natural Areas Committee is returning to Goose Pond Fish and Wildlife Area to help sponsor a two day [Saturday through Sunday, June 18th and 19th] bioblitz in Greene County, near the city of Linton, Indiana. The primary aim of the bioblitz is to continue to gather baseline information concerning the flora and fauna at the site. Goose Pond Fish and Wildlife Area, an extensive wetland restoration in southwestern Indiana, is maintained by the Indiana Department of Natural Resources. Indiana largest wetland restoration, Goose Pond FWA was constructed under the NRCS Wetlands Reserve Program, United States Department of Agriculture, and is the 7th largest wetland restoration in the United States [see Brief History]. The diverse habitats include ~4000 acres of shallow open water, 400 acres of bottomland tree plantings, 1380 acres of tall and shortgrass prairie plantings, and small mixed deciduous woodland. A map of the site is attached. The first bioblitz was held on July 16-18, 2010. Fourteen taxonomic teams reported 896 species [20 amphibians and reptiles, 37 bees, 73 beetles, 122 birds, 48 butterflies, nine damselflies, 21 dragonflies, 29 species of fish, four freshwater mussels, five fungi and allies, 27 mammals, 74 moths, four snail-killing flies, 379 vascular plants], 16 families of aquatic macroinvertebrates, and 18 genera of plankton. The 2016 bioblitz will be held a month earlier and should turn up many new additions. As always, we are looking for volunteers to participate in the bioblitz. You have been contacted because you have participated in similar events in the past or are a member of the Academy. This year I will organize the bioblitz participants with the assistance of our local coordinators Barb Simpson.